Step 1: Drink beer and eat pizza. 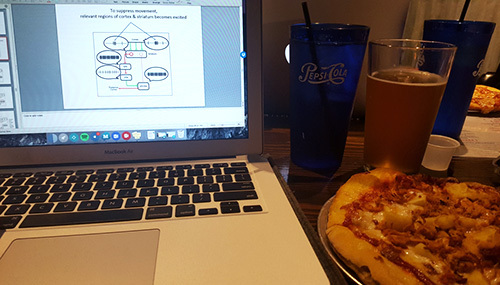 All jokes aside, studying in a bar has worked for me a couple times! Powerpoints are used all the time in my physical therapy program, but they tend to have more information and fewer pictures than in undergrad. Therefore, it’s essential that you know how to study them. It’s easy to just read a slide, then read then next, and read through the entire powerpoint without actually learning a significant amount of information. These are the only 4 methods that I’ve tried out, but I’m sure that there tons of other ways to learn from Powerpoints. The common theme of all of these is to stay active! Some people can learn from just reading information and remembering it, but I can’t. I have to actively write, draw, or speak, or I won’t learn very much. 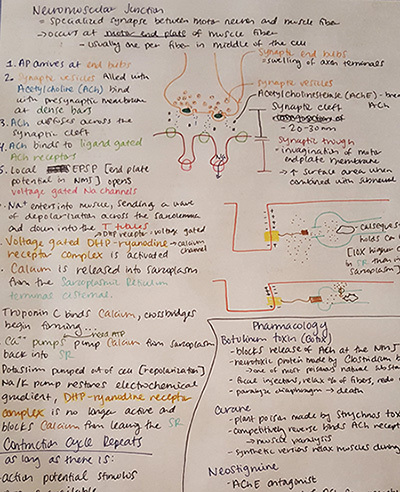 For pretty much every class, I found it best to make my own study guides when I was first learning the material. This was especially helpful for powerpoint slides, but you can use it for any class. Make one or two questions per Powerpoint slide. Try to focus on the more important concepts. Answer 5 questions from memory on a sheet of paper or a whiteboard. Read the slides to find the answers. Correct any answers that were incorrect, and add any information that you couldn’t recall. Erase your answers, and try to answer the same 5 questions from memory. Once you have a good grasp on the information, move onto the next set of 5 questions. This method forces me to quiz myself, so don’t passively read my notes. I have to actively think of the correct answer, and write the answer or draw any pictures associated with the question. I also love this method because I can learn the material in smaller chunks. 30 pages of notes can seem overwhelming, so it’s helpful to focus on 5 study questions at a time and really learn that information before moving onto the next chunk of material. We learned from Powerpoints in Advanced Physiology. This was fine for most of the information, but it became confusing for bigger topics. When a concept is explained over several slides, it can be difficult to piece all the information together. I rewrote the the group of slides onto one piece of paper and organized the information so it made more sense to me. This was easier than flipping between Powerpoint slides, because I could see all the information at once. For some powerpoint slides, it was hard to remember the information. My professor would ask what the diameter of a ribosome is (25-30 micrometers), and that’s not easy to remember when you have 60 other numbers to remember. I wrote this post about making and studying flashcards. At the beginning of the semester I made flashcards from all the powerpoint slides and that was a waste of time. I transitioned into making the study guides and rewriting the slides for the bigger concepts, and only made flashcards for the detailed information that I had trouble remembering. Powerpoints are boring. After several hours of studying them, it’s hard to keep studying them. Studying with classmates is helpful for every class, but especially if you have trouble focusing on the material. Quizzing each other and speaking out loud is helpful. Often times I thought I understood a concept until I tried to explain it to a classmate, and then I realized that I didn’t know it as well as I thought I did. Have you found any good ways to study powerpoints? Share below so others can learn from your techniques!